I am sure everyone knows what sunscreen is but I will still throw some light on it. Sunscreens are products made up of a combination of ingredients which help protect the skin from the sun's ultraviolet radiation (UVA and UVB). UVA and UVB rays cause premature ageing, damage the skin (burns) and could cause skin cancer. Sunscreens come in various formulations including lotions, gels, sprays, creams, etc. Sun Protecting Factor (SPF) is a measure of a sunscreen's ability to protect the skin from the sun's rays (damage, burns, etc). 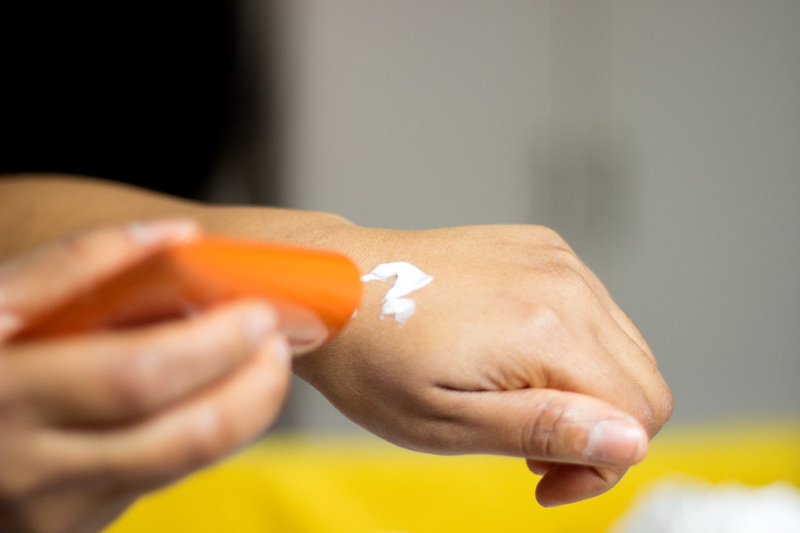 Most sunscreens usually state how much SPF they have in them.You can look at SPF in two ways- how much protection it offers the skin from the suns's rays or how much longer it will take unprotected skin to get burned when exposed to the sun. 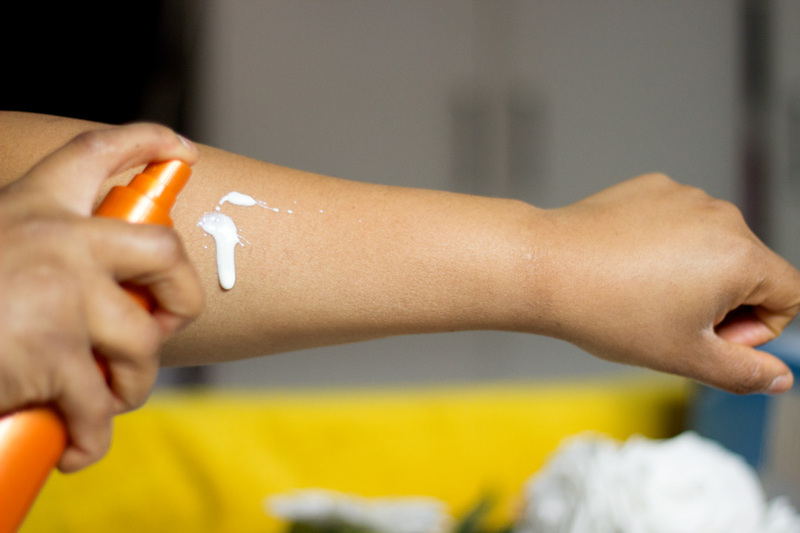 For example, SPF 15 will protect your skin from 93% of the sun's rays or SPF 15 means it will take 15 times longer for your skin to get red/burnt when exposed to the sun. SPF ranges from 10-50 although I have heard they have higher SPF than 50 but I've not seen them. Studies have shown that there is little difference in the degree of protection between SPF 30 and 50. Apparently, SPF 30 protects or filters off 97% of the sun's rays while SPF 50 filters off 98% of the sun's rays so it is not very significant. 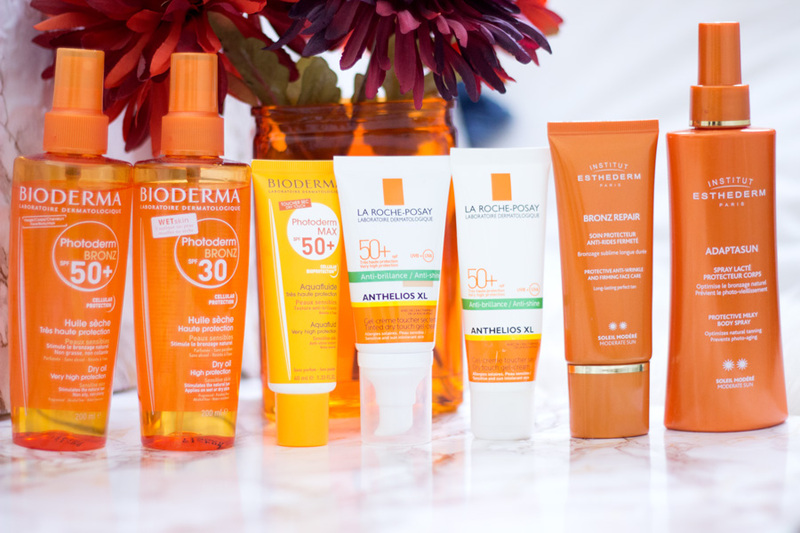 I have decided to talk about some amazing brands which make really good sunscreens that tick all the boxes for me- non-greasy, no bluish/whitish cast and no interference with my other skincare/makeup products. No surprises that they are all French skincare brands!! I know I have said this before but French skincare brands are just the absolute business; they just work so well!! I have tried quite a few Institut Esthderm skincare products and I have been so impressed with everything I have tried. I recently reviewed the Intensive Range which you can check out here. I have been trying out their sun care range for a few weeks now and I have enjoyed them. 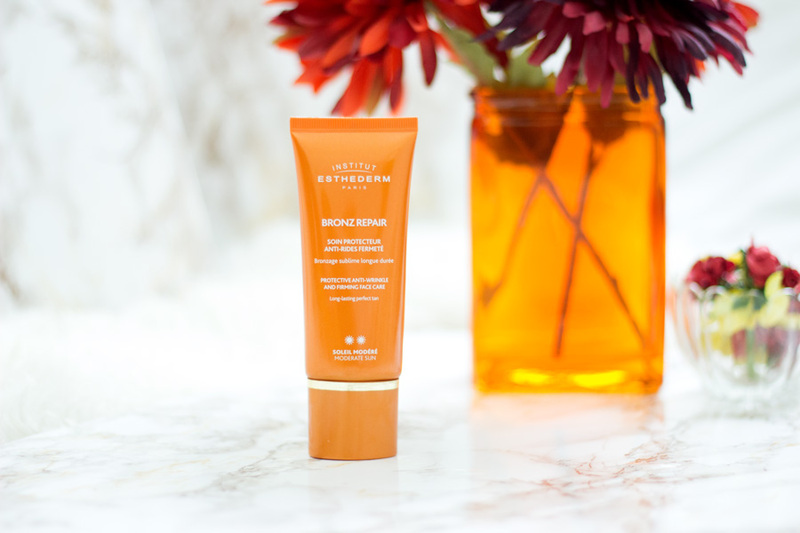 Institut Esthederm have a wide range of sun care products which you can check out here.The different thing about Institut Esthderm is that they don't classify their sunscreen products based on SPF so you won't see any SPF numbers on them. 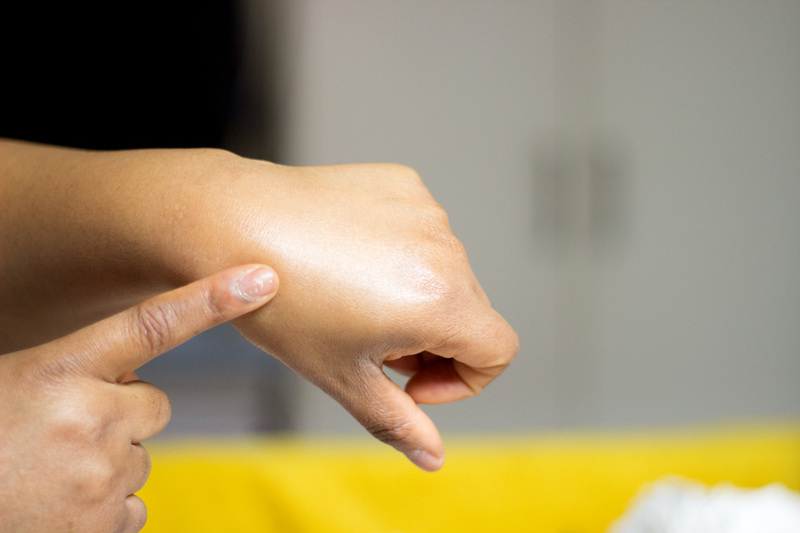 However, this does not mean that your skin is not being protected. According to Institut Esthederm, their sun care products go beyond the SPF instead their products help adapt the skin to sunlight conditions, prevent photo ageing while controlling inflammation. They also have other ranges that are designed for sensitive skin that can't adapt to the sun and others that completely block the sun's rays. 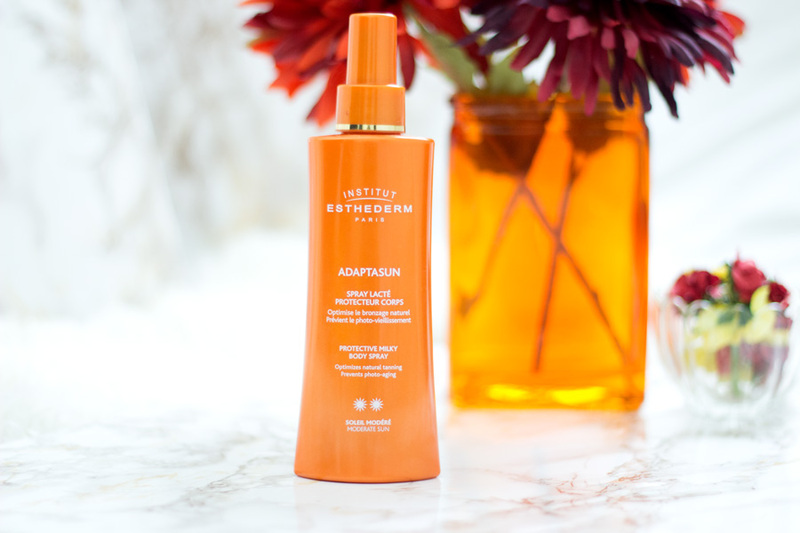 Today, I will be talking about their Bronze Repair Protective Anti-Wrinkle & Firming Face Care* and the Adaptasun Protective Milky Body Spray*. The Bronze Repair Protective Anti-Wrinkle & Firming Face Care*(Link //£55) (Bronze Repair for short) is designed for moderate sun exposure along with anti-ageing properties. First of all, can we address the super gorgeous packaging? I love it so much!! It looks and feels so luxurious; and of course, a luxurious price tag to go with it!! It has a slight fragrance to it but it is such a pleasant one. It also has a yellow tinge to it (which I love because I have a warm golden undertone) but it does not transfer any colour to the skin. Instead my skin just looks naturally radiant and healthy. It has a lovely light texture and it absorbs really quickly so I can get on with the rest of my skincare and makeup. I don't have to rub it in or wait for it sink in at all. I always judge a sunscreen's ability to protect my skin based on improvements in my hyper pigmentation. For example, if I don't wear sunscreen my hyper pigmentation marks get really dark over time when exposed to the sun but when I wear sunscreen, it gets lighter or does not get darker. I have to say my hyper pigmentation are not getting darker so I know it is working well. I am really pleased with this sunscreen and will continue using it. The Adaptasun Protective Milky Body Spray* (Link //£39) is designed to help the skin adapt to the sun (hence the name "Adaptsun"). The Adaptasun Protective Milky Body Spray offers protection against UBV, UVA, Visible Light and Infrared. I already mentioned that I don't wear sunscreen on my body often except when we are deep into summer or when I am away on holiday. However, I have been into wearing sunscreen especially on my arms and legs in the past few weeks. At first, I was a little sceptical of its colour (milky white colour). However, I was pleasantly surprised to find that it blended in so well into my skin. I was absolutely shocked!! It has a fluid texture just like water and there's no greasiness in sight. It also does not feel tacky on application and when it is absorbed which I think is brilliant. I have to say I am way more impressed with this sunscreen than I imagined. There's a slight fragrance to it but again it is a pleasant one (very summery). I have not worn it long enough to notice any difference yet but I will keep you posted on it. If you are going away for holiday and you are looking for a new sunscreen body spray, I'd recommend giving this a try. 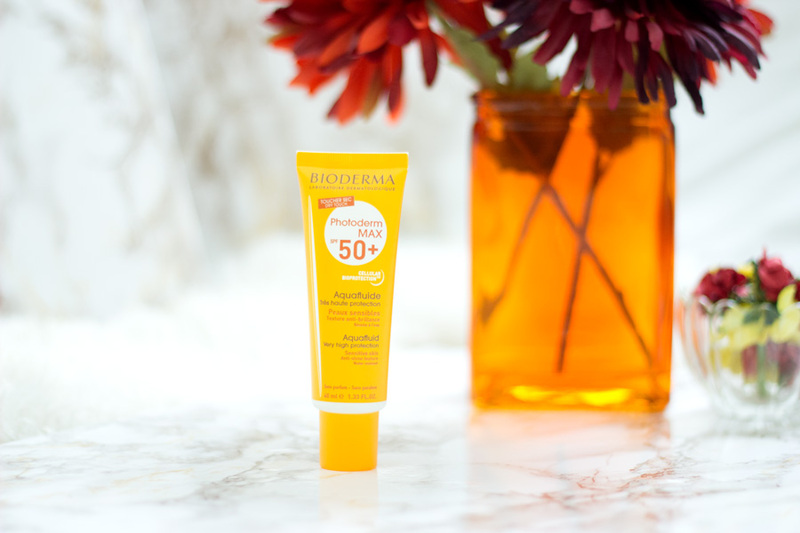 I was recently invited to the Bioderma Sun Care event which I absolutely enjoyed and I will be talking more about the event in another post. 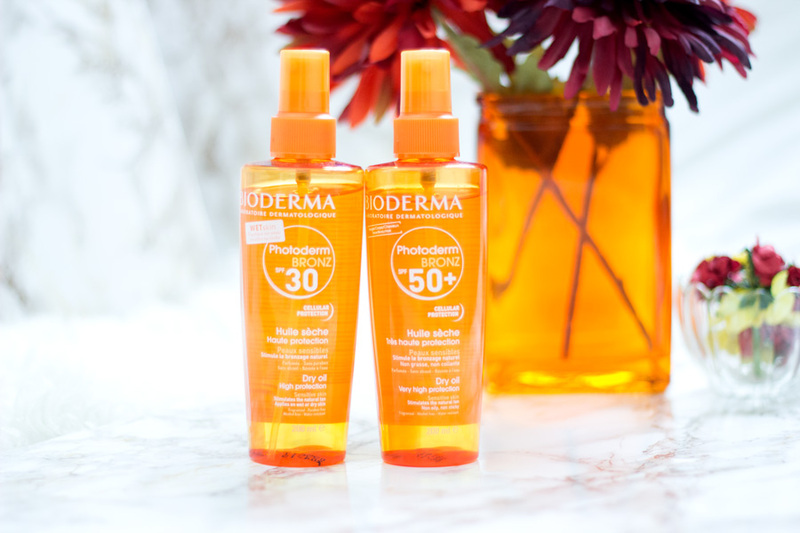 Before the event, I was sent the Bioderma Photoderm Bronz Dry Oils in SPF 30*and 50* a few weeks back so I had given them a good try. 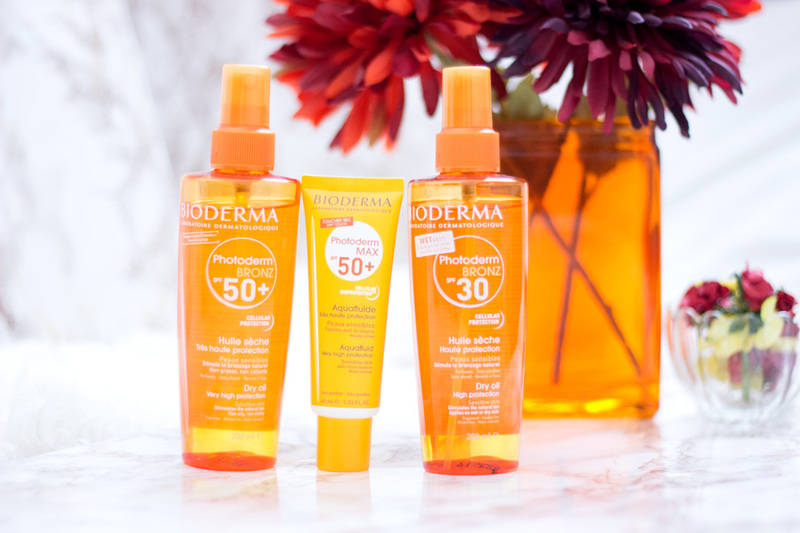 At the event, I was kindly gifted the Bioderma Photoderm Max SPF 50 Aqua Fluid* which I have tried for a few days so my thoughts are just my first impressions. I am sure everyone knows Bioderma for their best selling Bioderma Sensibio Micellar Water which is one of the best I have tried. To say I am obsessed with it is a serious understatement. I have two reviews over here and here if you fancy a read. Apart from their Sensibio Micellar Water, they make a wide range of skincare products which are actually incredible. 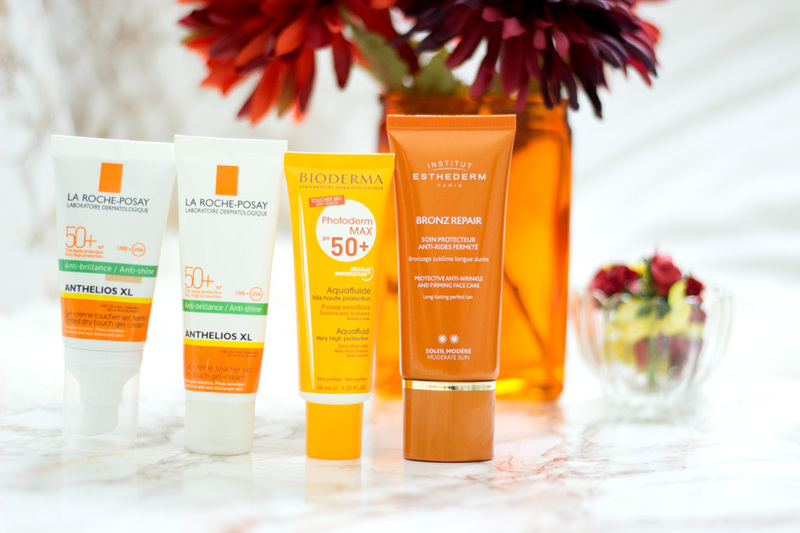 Their Sun Care range (Photoderm) consists of many products and there's something for everyone from adults, children, etc and they come in various SPF covers (30-50) and even sun blocks. 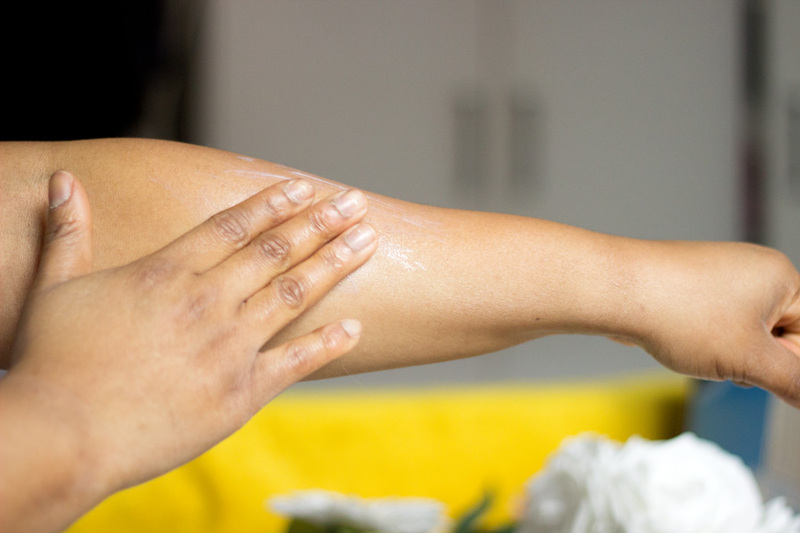 Most importantly, there is a wide range of formulations to choose from including lotions, fluids, sprays, creams, etc. I will be focusing on two products- The Photoderm Aqua Fluid SPF 50 and the Photoderm Bronz Dry Oil SPF 30 & SPF 50. 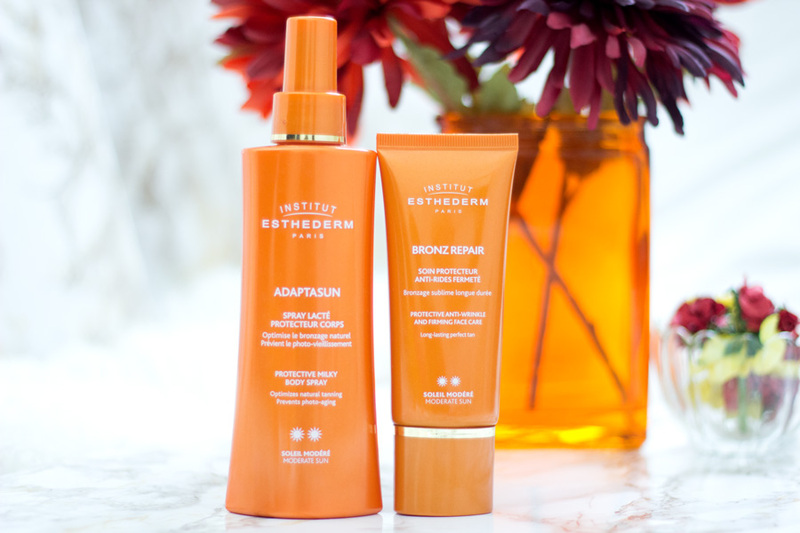 The Photoderm Bronz Dry Oil SPF 30* & 50* (Link //£22.10) is designed for the hair, body and face but I use mine mainly on my body. I only recently found out it can be used on the hair so I can't wait to try it on my hair. 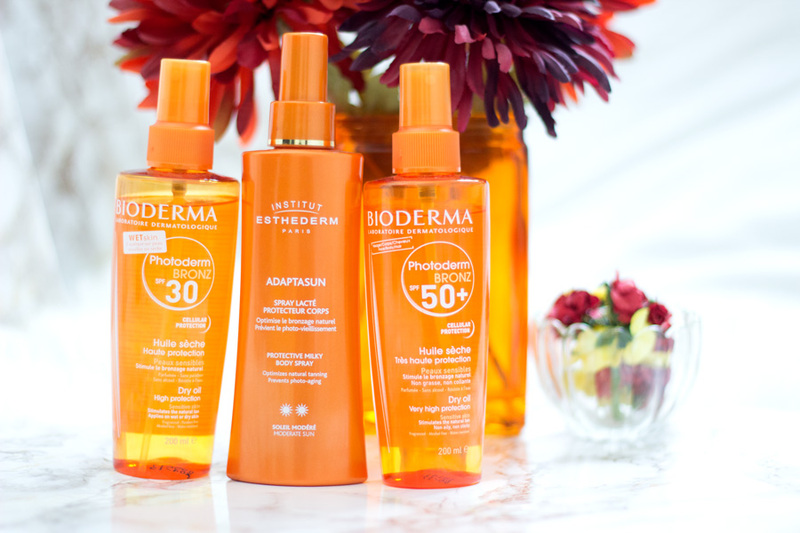 According to Bioderma, the Bronz Dry Oil offers the dermatological safety of a high protection against the sun combined with a transparent texture. It is mainly designed to enhance your tan while protecting your skin. During Summer/Spring, I definitely get darker and I don't mind at all however I want minimal damage to my skin which is where this Bronz Dry Oil comes in. It comes in a beautiful orange bottle with a spray pump and this sprays quite beautifully. I have to say it is one of the best smelling sunscreen products I have ever tried. It smells of the best summery holiday you can ever think of (that's the only way I can describe it!!). I already mentioned I don't use it on my face because it is an oil but if sunscreens were suitable at night, it would be my go-to!! It is a non-greasy oil so the name dry oil totally suits it and it provides a beautiful glow to the skin. I love using it on my legs because it just makes them look fabulous. If you are after a nice dry oil that will enhance your tan while protecting your skin, I will highly recommend trying the Photoderm Bronz Dry Oil. 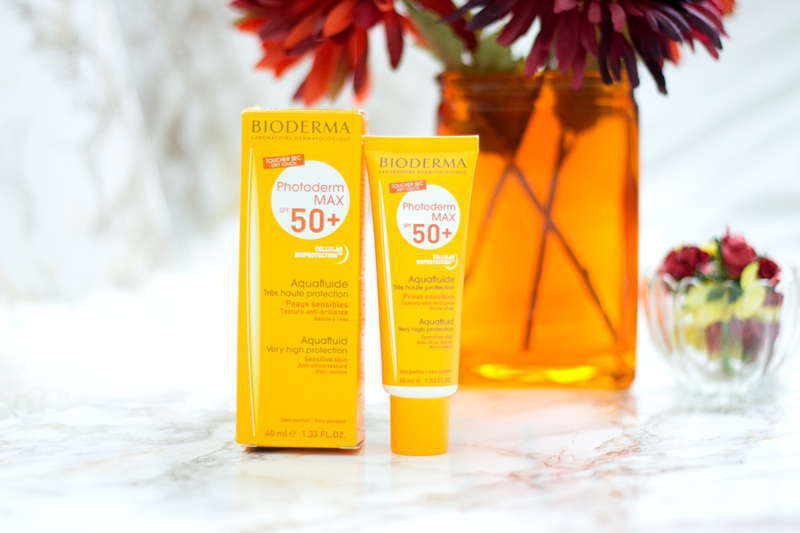 The Photoderm Aqua Fluid SPF 50* (Link //£13.10) is designed for sensitive skin or skin types that are intolerant to any kind of sun exposure. It provides very high protection as you would have guessed from it being SPF 50 and it's suitable for all skin types including oily skin. I was a little sceptical about it being a fluid (very watery texture) as this kind of texture usually leaves me oily or dewy. However, I was really surprised to see that it actually sets matte when it is fully absorbed (or at least not dewy). I do have to mention that you have to be careful when dispensing it due to its texture as there may be some wastage. It comes in a milky colour (which also scared me) but it is clear on application and thankfully, there's no white/blue cast. Overall, I am enjoying it so far and I will be talking more about my experience with it when I have tested it fully. If you are after a fluid textured sunscreen, I'd recommend giving this a try. 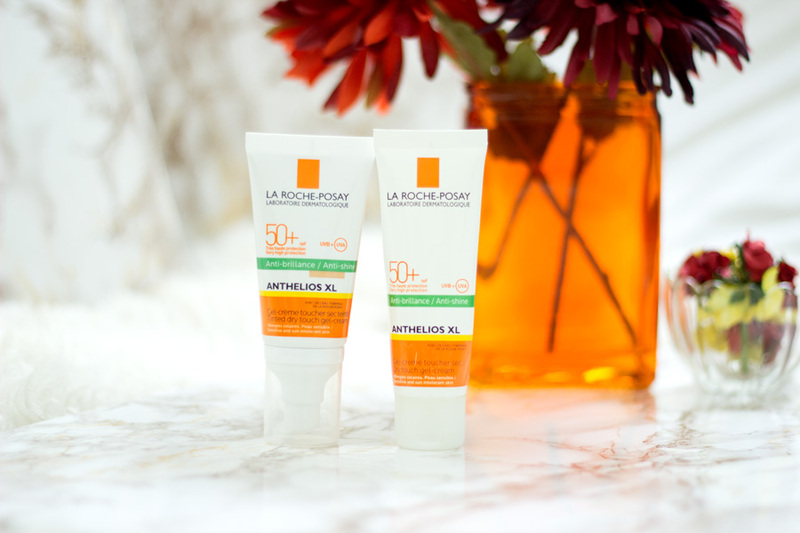 If you are a regular reader of my blog, I am sure you would have been so tired of me talking about La Roche Posay Anthelios range. I have consistently used the Dry Touch Gel Cream SPF 50 and I absolutely love it. For me, it works as a sunscreen and a primer because it has a lovely mattifying effect which helps my makeup last longer. 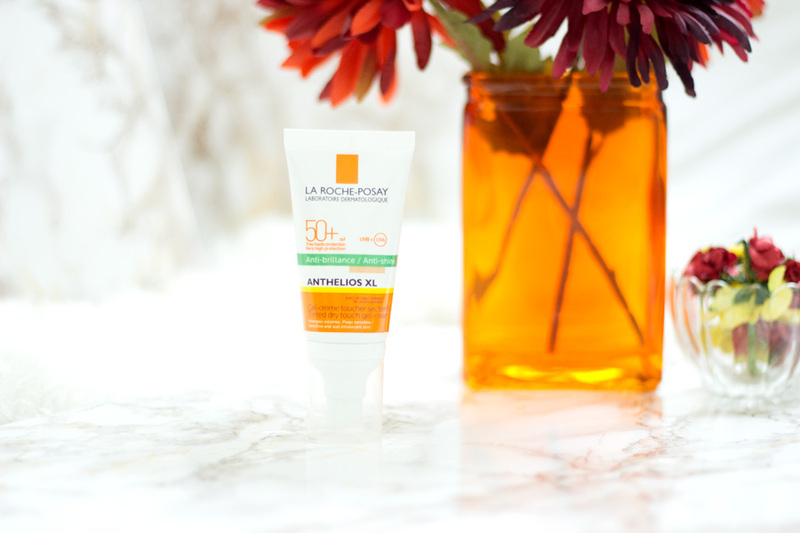 La Roche Posay have a wide range of sun care products which suit everyone from normal to dry skin to combination to very oily skin. Their main sun care range is called Anthelios which is suitable both for adults and children including anyone with sensitive skin. Their formulation covers lotions, sprays, fluids, milks, tinted gels/creams, etc. I currently have two products- Anthelios XL Dry Touch Gel Cream SPF 50* and the Anthelios XL Tinted Dry Touch Gel-Cream SPF 50*. I won't talk too much about the Anthelios XL Dry Touch Gel Cream SPF 50* (Link // £16.50) because I have written several posts on it which you can find here and here. I just love it and it works best for my combination oily skin. It does not give off a a blue/white cast, non-greasy and has an anti-shine effect on my skin. If you do have dry skin, you will be better off with the Anthelios Fluid or Comfort ranges which is best suited for normal to dry skin. 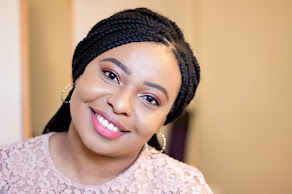 As it is SPF 50, it provides very high protection and I feel very confident whenever I wear it because I know my hyper pigmentation will not get any darker. The Anthelios XL Tinted Dry Touch Gel Cream SPF 50* (Link //£16.50) was one of their recent launches last year and I was kindly sent a tube. It works exactly the same way to the non-tinted version in terms of sun protection. It is also Non-Comedogenic and does not contain Parabens. I love the packaging too as it has a nice pump. I feel it has a higher mattifying effect compared to the non-tinted version which is really great if you have very oily skin. I am always very sceptical when any skincare or makeup product is marketed as tinted or universally tinted (especially if it is just one tinted shade). This is because many tinted products tend to look ashy on darker skin so I tend to avoid them. 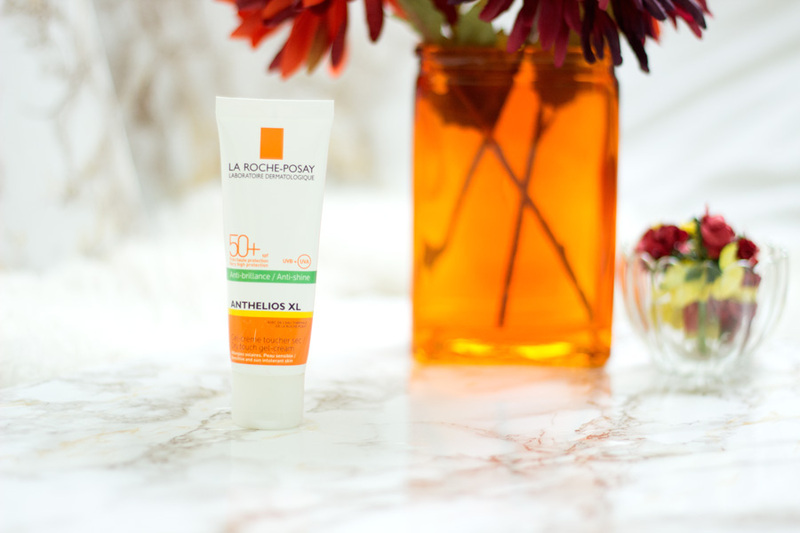 According to La Roche Posay, it contains a a universal micro-pigment which melts into the skin and adapts to the skin's complexion/ skin tone. I have to work it in a little bit more than the other sunscreens I have tried and it eventually gets absorbed. However, it has to be the best when it comes to keeping my skin matte while providing high sun protection. If you are darker than me, I will recommend trying out the non-tinted version. However, if you have a light/fair complexion and you struggle with finding a good sunscreen which also controls oil, look no further as this will work so well. I think you can even get away with no foundation as it is tinted. 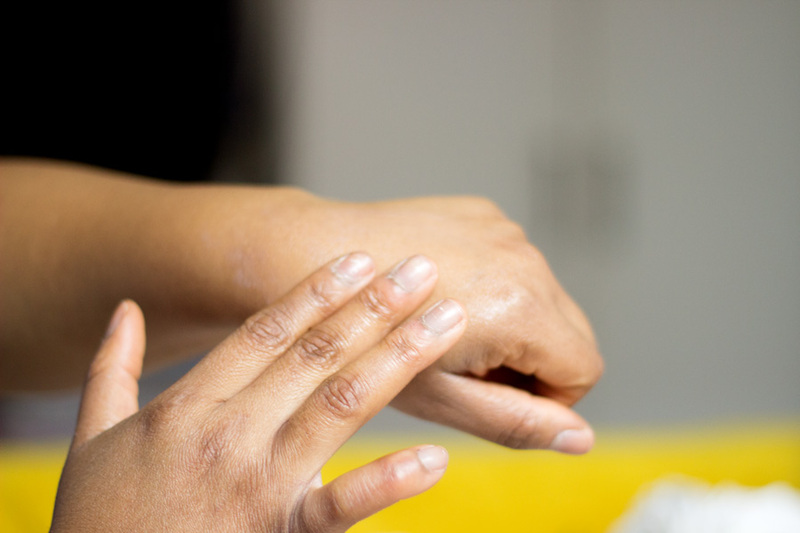 If you have dry skin, you are better off trying out the Anthelios Fluid or Comfort ranges. I hope you enjoyed this post and I know it was quite long but sunscreens are quite important for all skin types. I am sure you may be wondering which sunscreen is my favourite. Well, it is very difficult to choose because it depends on my mood and the weather. I would say the Institut Esthderm Bronze Repair and the Anthelios XL Dry Touch Gel Cream SPF 50 are my favourites for my face while the Bioderma Photoderm Bronz Dry Oil is my favourite for my body. See you in my next post. Have you tried any of these sunscreens?